PRESIDENT BARACK OBAMA: By a wide margin, the biggest threat to our nation's balance sheet is the skyrocketing cost of health care. It's not even close. PAUL HOWARD, MANHATTAN INSTITUTE: The reality is everyone is willing to sit down at the table and have a great discussion until the question comes becomes who is going to pay for it? It is like inviting 100 of your best friends out to dinner, and everyone wants to know who will get the check. BRET BAIER, HOST: The White House health care forum happened today, President Obama inviting a number of guests to talk about health care. He wants to lower costs and expand coverage this year. What about healthcare as an issue? Let's bring in our panel tonight: Fred Barnes, executive editor of The Weekly Standard; Judith Miller of The Manhattan Institute, and syndicated columnist Charles Krauthammer. FRED BARNES, EXECUTIVE EDITOR, THE WEEKLY STANDARD: Well, for one thing, I think the premise on which President Obama said we have to act on health care this year is entirely wrong. He said we have to do it in order to create jobs and rebuild the economy and get the federal budget under control. The truth is for the last 25 years health care costs have been rising slowly. They're not exploding the way President Obama says. They have been gradually rising and they're pretty expensive. During that period, we have created 40 million jobs in the country. The economy has been mostly strong. And until really the last year, the federal budget has been under control. So the premise is wrong, but it's wrong for a reason. The president has a motive for saying that. He wants to get his health care bill passed immediately, and he's using the bad economy as an excuse for doing it now. But I would ask this: If it is so important, if it is so significant, if the very economy — the success of the economy rests on it, why in the world would he turn it over to Democrats in Congress to write the bill? Why would he have Nancy Pelosi do it? Doesn't he remember the stimulus? That wasn't the world's greatest success. JUDITH MILLER, MANHATTAN INSTITUTE: I think that is what he has done. He has turned over consistently things that he should be doing to the Congress. I'm beginning to wonder, as David Brooks argued, whether or not the president is really taking on too much. On one hand, you don't want him to wait 11 months, as the Clinton administration did, to deal with something which is clearly on the minds and in the pocketbook concerns of the American people. On the other hand, energy, education, health care, even global warming, I mean, it all seems to be getting the same kind of priority as getting the economy going again. And I think there's only so much a president can do, especially, as you pointed out earlier today, with a limited number of people in the key slots he needs to carry out the programs. CHARLES KRAUTHAMMER, SYNDICATED COLUMNIST: I wouldn't be concerned if he waited 11 months or 20 months. I think he ought to wait until at least he offers a plan on the banks. The reason our economy is in the tank and really sinking and there is a lack of confidence is because we're in a financial crisis which, as Fred indicates, is not in any way caused by health care and it won't be cured by a reform of health care. What the president is saying, which I think is true, is that in the long run, we have to have control over the cost of health care. And I think what he told The Washington Post and some people in public and private before the inaugural is that he has a sort of grand strategy of getting the control of entitlements — retirement, Social Security and Medicare — and that will save tens of trillions. So the implication is he's willing to waste a trillion here or a trillion there on stimulus pork as a way to win allegiance of Congress and get the reform of the entitlement. However, in the speech he made to Congress where he spoke about the reform of Medicare, which is the biggie of this, he didn't speak about cutting its costs. He said it's going to have to be in a package with the reform of all of health care, and the reform of all of health care he wants as an expansion of health care to almost 50 million uninsured. And he himself has said it would require an increase of spending of about a trillion dollars. So, on the one hand he has the idea of cutting entitlements. On the other hand he offers expansion of health care of a trillion. So obviously he's not serious about a cutting of entitlements in the long run. BAIER: Judith, what about the PR rollout here? He started this event today at the White House, among other things, saying the cost of health care now causes a bankruptcy in America every 30 seconds. Later in the day, the White House couldn't back that up with any stats. They pointed to a 2005 Washington Post column written by a Harvard scholar, but it turns out that the numbers really didn't develop. What about the PR rollout here? MILLER: I think this is the first time he has really had a lot of trouble with the underlying numbers. And I think that that was part of the problem with the message. MILLER: — billion — to deal with this without having a plan. So he's basically saying, and he said in this speech, if you have a doctor you like, you're going to keep him or her. If you have an insurance policy you like, you're going to keep it. We're just going to make sure you pay less for it. How is he going to do that? I think the market reacted badly today. I think people are worried about a budget deficit that is soaring out of control. I think we are seeing some credibility problems. BARNES: I think certainly on this speech he has credibility problems. Look, the only way you're going to get down costs is one, you have to get rid of the third-party payer system, whether it's the government or whether it's your boss. If you do that, people don't pay any attention to costs. And, secondly, look, health care costs will go up because we get these great medical innovations. You want to get rid of MRIs? Do you want to have people waiting in line for them? I don't think so. And they're going to drive up cost for good reason. BAIER: It's not a healthy situation for the U.S. or Israel. We're talking about the prospect that Iran could have a nuclear bomb within a year. SEN. JOE LIEBERMAN, I-CONN.: The hard truth is that Iranians are determined to acquire nuclear weapons. BAIER: The panel discusses what can be done about that after the break. WILLIAM SCHNEIDER, DEFENSE SCIENCE BOARD: The ability to go from low enriched uranium to highly enriched uranium, especially if they expand the number of centrifuges, would be in a relatively brief period of time, perhaps a year or so. OBAMA: To the extent that we are lessening Iran's commitment to nuclear weapons, then that reduces the pressure or the need for a missile defense system. BAIER: That's the environment we're in. That was the president earlier this week. A new report by the Washington Institute for Near East Policy prepared by 15 high-ranking current and former U.S. officials warns that Iran could have a nuclear weapon within the year. We're back with the panel — Charles? KRAUTHAMMER: Contrary to what the president just said, there's nothing that we are doing or will do that will lessen Iran's commitment to acquiring nukes. All of this stuff happening diplomatically is a charade, as it was in the past and is now. The only thing that would stop the Iranians, conceivably, would be a complete embargo, including refined petroleum, meaning gasoline, which would shut down its economy. A, that may not even deter them, and, secondly, the Russians and others, and even the Europeans are not going to go alone, which means that in the end, it will be Israel acting here — 6 million Jews in Israel are not going to allow a country that is threatening genocide to acquire a genocidal weapon. We have to prepare ourselves for an Israeli attack by the end of this year. BAIER: And that is also in this report, that that action could happen. MILLER: But, I have to say, I'm with the president on this one. I think that we had eight years of calling the Iranians names, making it clear that they were part of the axis of evil. It doesn't help to have the Europeans try engagement on their own, which is what has been happening. What we really need to do is give it the good college try to see if there is a deal to be done. And let's say it doesn't succeed, and the Iranians continue on their merry way, trying to have a bomb and trying to have relations with the world. At least then America will be able to say we have tried negotiations without preconditions. We have done everything we can. And it will set the stage for really tough sanctions. And, if that fails, unfortunately, military action. BARNES: That sounds nice. I'm afraid you're dreaming, Judith. Sometimes people, like the North Koreans and the Iranians, want, more than anything else in the world, nuclear weapons, because there's great value, there's great strength in being a nuclear power. We don't want them to be because they're irrational and crazed and will spread them into other places in the world. But they want them. Sanctions aren't going to work. The Russians aren't going to help. The Israelis, I don't see — here's the problem, though. 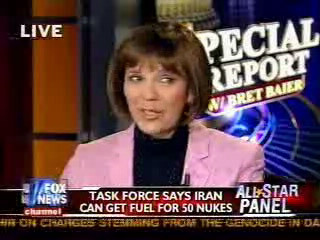 I don't see how we can get the Israelis on their own take out the Iranian nuclear facilities. The U.S. will be blamed anyway — oh, we gave the Israelis a green light. If this is going to happen, it better be something done where the U.S. plays a part, so it's done right at least. BAIER: In context of this Russian letter that the president sent out to help with Iran, we get this report that's, frankly, pretty scary. KRAUTHAMMER: Look, I think even if the U.S. sold out the Czechs and the Poles and the Georgians and the Ukrainians in the bargain, I'm not sure Russia would help us on Iran, and even if it did, I'm not sure it has sufficient leverage to actually stop a determined Iran. I don't see anything diplomatically stopping them. I would agree, if you want to have a negotiation which looks nice and you know will fail as a way to set up an attack, that's OK. But I'm not sure that's how the Obama administration is thinking. MILLER: There may be a deal that can be done. There is usually a price at which people will say, you know, maybe this won't work. There was a price for Libya. There is sometimes a price, and I don't think that we will lose any more than six months or eight months on this approach.